Supporting business growth, profit and change objectives. 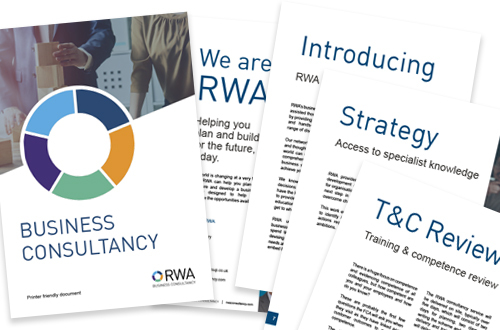 RWA’s business consultancy services support clients throughout the UK in meeting their growth, profit or change objectives. If you would like to take the next step in your organisation’s development, the team at RWA can support you every step of the way. Whether you are looking to enhance profits, develop growth strategies, embark on mergers or acquisitions, or put a succession plan in place, RWA's experienced consultants are here to help. For those struggling to navigate their way through the regulatory landscape, consultants can provide the guidance, contacts and practical experience needed. For further information on RWA and how it can support your business, download our brochure and submit an enquiry today.